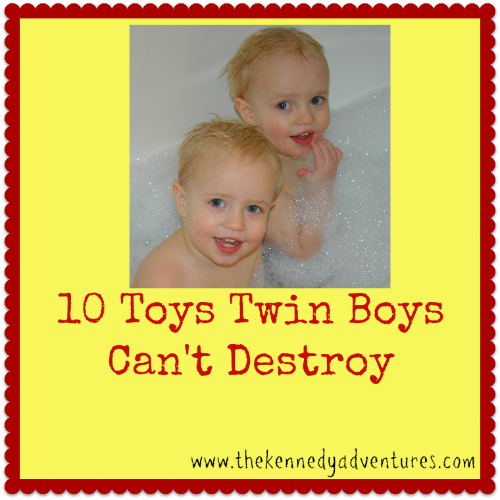 10 Toys Twin Boys Can't Destroy - The Kennedy Adventures! In our house, toys better be sturdy to stand up to two rough and tumble boys. For the past five years, these are the toys that have passed the test of my twin boys. I’ve had one of these in my house for the past fifteen years or so. My oldest daughter, now 18, had a version when she was young. Currently, we have a pink version in our garage. 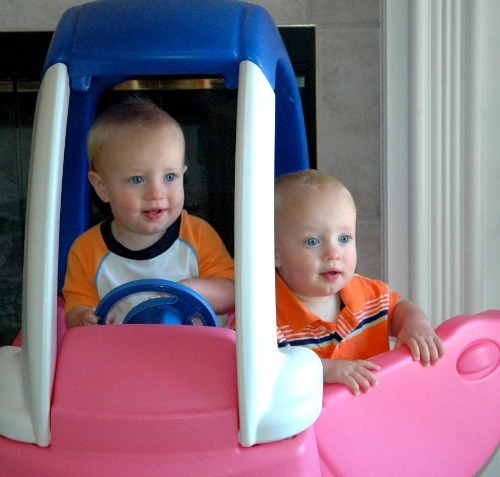 The boys didn’t mind the color -it served just fine as a getaway car. Keep your eyes peeled for these at yard sales and thrift stores. 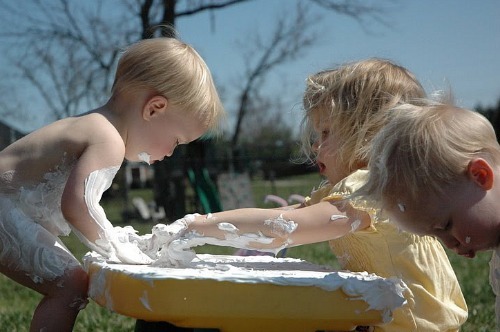 If the colors are faded, there’s all sorts of tutorials available for customizing your child’s coupe. I’ve been a huge M&D fan for years. Their quality products are well loved in our home. My husband picked up this easel for a steal at a local Goodwill, and we’ve been using it for school for all three children. My grandmother picked this table up for us while she was shopping the worlds longest yard sale. It’s been gracing our back yard for about 4 years now. We used it to transition the boys from high chairs to a regular table, craft projects, and impromptu picnics and fun in the back yard. As a mother, I’m just now learning that there are stages with Legos. First comes toddler Legos. Then, little ones graduate to Duplo blocks. Finally, your kids are ready for tiny Legos. I bought a huge set from Lego Education for the boys this Christmas, but I think they are still a bit too young for this style. Right now, they enjoy building cars and weapons out of the duplo kit. A bike with no pedals? Weird, huh? Not around here. Balance bikes grace the walls of our garage, instead of standard bike with training wheels. You’ll see my kids zipping up and down our streets. 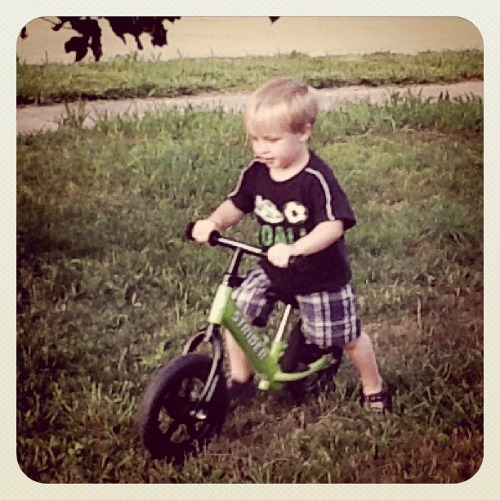 Rachel outgrew her balance bike, then went straight to a standard bike with no training wheels. The boys will be ready to move up to a standard bike by the end of the summer. Don’t forget the helmet! Even though I’m not talented, I love to introduce my children to lots of music. We have a giant box of musical instruments that the kids love to shake, rattle and bang. 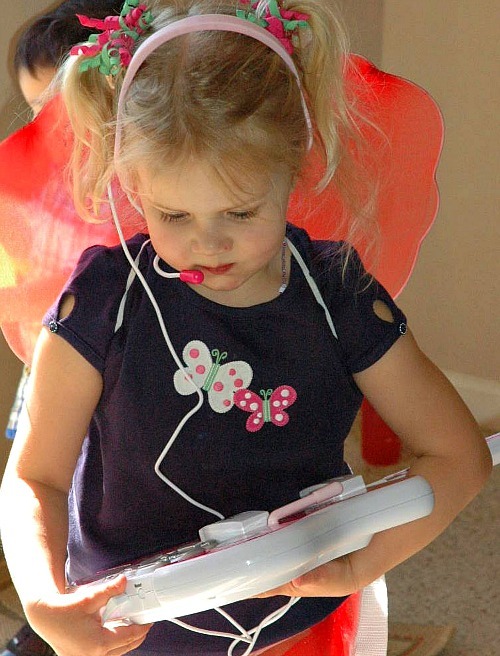 Don’t miss these free resources to teach music to children over at The Homeschool Classroom. 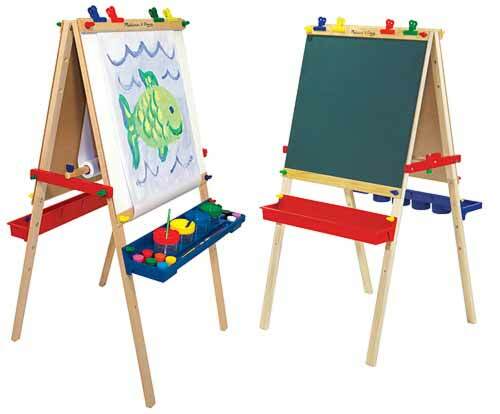 These are great for teaching so many things: shapes, fine motor skills and more. When the boys were small, we used these knob puzzles. As they’ve gotten older, we’ve graduated to chunky puzzles and more complicated puzzles. 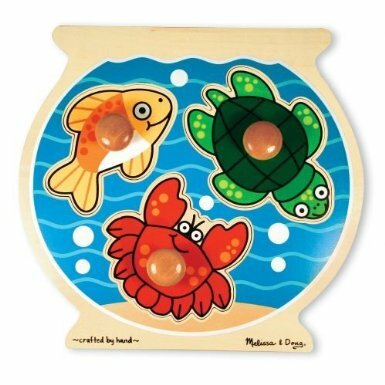 Need a durable toy to keep your little boy (or girls) occupied at the doctor’s office, during church, or on a long car ride? We love Magna Doodles around here. The kids get to draw and practice letters, totally mess free! Do your boys need to blow off some stream? Let them expend some energy with a Plasma Car — even adults can take a spin! I picked the kids some Anamalz for Valentine’s Day this year and fell in love. 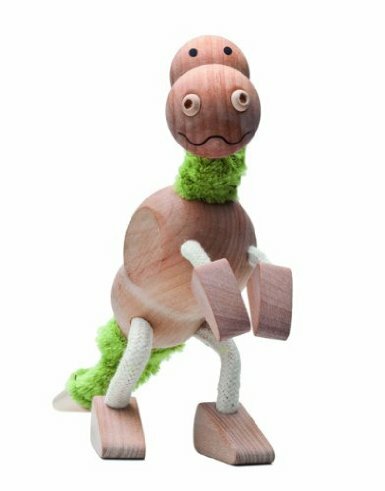 They are made from wood and have bendable legs. The boys’ favorites are dinosaurs, but we also have horses and a rhino, too. I’d love to hear your ideas for boy proof toys! What has lasted in your house? Be sure and leave your thoughts in the comment box! Have a Top Ten Post of your own? Link up with my good pal Angie over at Many Little Blessings for Top Ten Tuesdays. I’m looking forward to the next 10 weeks! 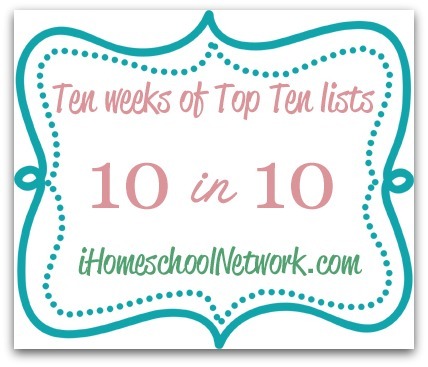 For the next few weeks, I’m joining my friends at iHomeschool Network for our 10 in 10 Series – 10 amazing weeks of top ten posts on homeschooling topics. It’s going to be so much fun! Sign up for email updates so you won’t miss a thing! Legos are on my list too. 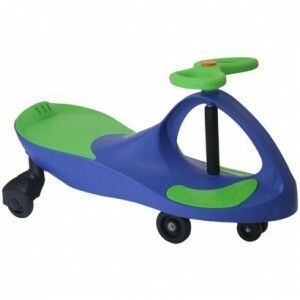 I would really like to have a plasma car. I have a pink one on my Amazon wish list. I probably should modify the LEGOs to say, “Dangerous for moms” — I’ve stepped on quite a few! Oh, and Jennifer, the PlasmaCar is on Zulily today! You’ve compiled a great list there! I’m intrigued by the balance bike. Have to check that out. Legos/duplos are definitely an old standard around here, too. You’ve given me some great ideas for my gift list. Thank you! The balance bikes are amazing — they really are helping my kids to learn to ride a standard bike better. They learn the balance first, then the pedaling is easy. great list, but we have managed to destroy that Plasma Car. Sigh. Visiting from Ultimate Mom Linkup. oh, no! You’ll have to tell me if they were big boys or little boys! This is a great list – thank you for linking it up at Ultimate Mom. My husband is a twin – I know he will get a kick out of it when I show it to him. 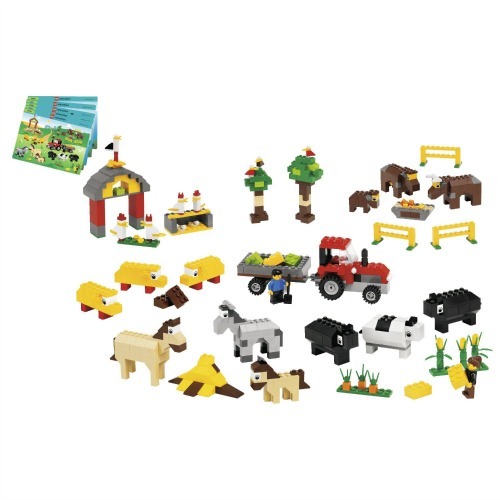 And I’ll share this – these toys will also last through a boy/girl who are close in age! You’re right, Rebecca … these toys are TOTALLY gender friendly. I love it that your husband is a twin! I’ll bet he has some stories to tell! The various different trucks from Melissa & Doug have been holding up very well with my very rough 3 year old son. We have a bunch thanks to my mom and my son loves them. We have the garbage truck, fire truck, car carrier and excavator trailer to name a few. I had no idea that M&D had cars and trucks! I’ll have to check them out! the littles tikes coupe and balance bike are top of our list to. My son is a bit of an unintentional destroyer too. Have you come across WOW toys. We had their friction motion recycling truck and it was indestructible – Goblin used to sit on it and drive it round (not what it is intended for) and drop it from great heights and it was still in such good condition that when he finally stopped playing with it we were able to give it to a friend for their kids birthday. This is great! I’ve got 7 month old identical twin boys so I’m definitely going to need to refer back to it. We’ve had great luck with Green Toys. I don’t have twins but I do have 3 toddlers. My kids loved their two trucks to “death” and broke them. 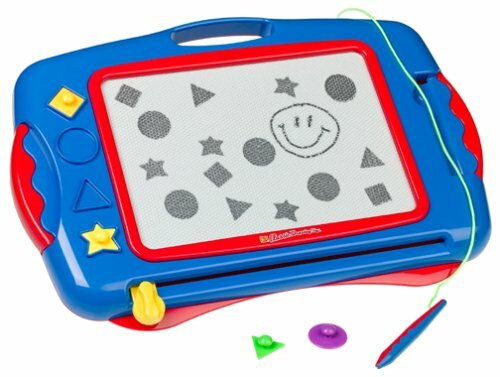 I contacted Green Toys and they sent me replacements free of charge. Made in the USA with recycled plastic and great customer service.